Click to view our two-part DNA Barcoding Animation that supplements the Genetic Research curriculum in general, and the Wet Lab lessons in particular. The development of these materials was funded in part by an ITEST grant from the National Science Foundation DRL-0833779. Any opinions, findings, conclusions, or recommendations expressed on this website are those of the authors and do not necessarily represent the official views, opinions, or policy of the National Science Foundation. NOTE: To download the Cn3D files, right click and save the file to your desktop. Otherwise these files will open as text. In this lesson, students synthesize the information they have learned throughout the unit about people in various careers who use bioinformatics. 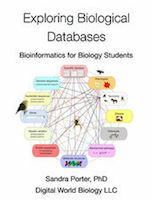 Students then have the opportunity to perform independent research about a career of interest before developing a resume to use when applying for a bioinformatics-related job. Students also learn about writing cover letters. Optional extensions include peer-editing of resumes and/or cover letters, and a mock interview for a job related to a career of interest.